At this point, I’m sure that you have heard about or seen the latest sensation, Marie Kondo and her Netflix series, Tidying Up. She also wrote a NY Times bestseller, The Life Changing Magic of Tidying Up and developed the KonMari Method of organizing. You know she is a cultural icon when she starts doing the rounds on late night TV talk show—she appeared on The Late Show with Stephen Colbert recently. So what’s all the fuss? Well, first off, Marie Kondo is adorable in appearance and manner. She brings some stylized Japanese traditions to her organizing process, such as bowing and kneeling to possessions that you’re ready to let go of but would like to give thanks for their service. She folds clothes in a method that can be described as similar to the art of origami. Truly, what’s not to like. Her big go-to question about clients’ possessions: “Does it spark joy?” is not only catchy but it is a wonderful way to determine whether one should keep something or not. Unfortunately, we all have too much stuff. However, many of my colleagues and myself have always asked our clients similar questions, such as, “Is it totally useful or it something that is totally beautiful and makes you happy?” Many of us American professional organizers have been working for years with various clients and transforming lives. Yet, our industry was suffering from a lack recognition when compared to other service industries. 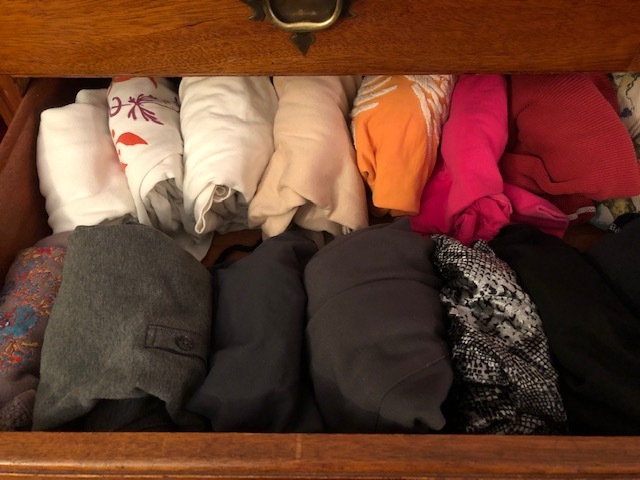 I’m really happy that Marie Kondo has brought such great attention to the importance of organizing. Many of her organizing concepts translate beautifully to improve American lives. And there are a few that do not—[from her book] “her basic principle for sorting papers is to throw them all away.” Hmmm, I’d like to see that work with my clients (over the age of 35) who angst over tossing most of their papers and files. I find that this concept will only work with millennial who typically don’t even own a checkbook. But her larger concepts really resonate with many people. I particularly liked her final chapter where she says “the magic of tidying dramatically transforms your life” by putting your house in order you can discover what you really want to do, how you want to live your life and attain peace of mind. I totally agree. Some of you may remember that I used to have as my tagline for my business: “Have your surroundings be a reflection of who you are or who you are becoming…” implying that I wanted to help people alleviate clutter and chaos; have their homes become their sanctuary; and for them to focus on being their most authentic selves. I still want and work towards that for my clients today. So thank you Marie Kondo and Netflix for bringing long overdue recognition to our professional organizing industry. This brings me joy. And for those of you who want to learn how to fold your shirts so they stand up in neat little packs, or other organizing techniques, please contact me. Marie Kondo is already booked.